Keep your cool when it's all on the line. 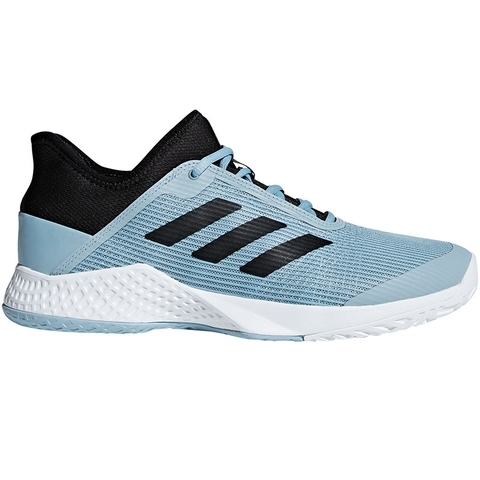 These lightweight tennis shoes have a breathable mesh upper to keep air circulating when the heat is on. Their foot-hugging construction and supportive chassis offer a stable feel. The durable outsole gives a firm grip with every serve and slide as you improve your game. These men's tennis shoes feature Climacool for allover ventilation. Their lightweight mesh upper locks your foot down, while a supportive Sprintframe chassis adds stability. Adiprene+ cushioning aids takeoffs and landings. The durable Adiwear outsole excels on multiple surfaces.